On Feb 4th, 2018, on the eve of Chinese New Year, news broke that the Chinese government had announced the ban on all foreign cryptocurrency exchanges and ICOs. The flourishing cryptocurrency trading market crashed on New Year’s Day. Bitcoin price nosedove to a mere US$6,920 the next day after hitting an all-time high of US$19,783 earlier. Before that, the Chinese Yuan accounted for 90% of all crypto trades. The crypto world was shaken. The critics announced that China practically killed Bitcoin trading, while some applauded its move, saying that China saved the world from a mega cryptocurrency bubble in the nick of time. 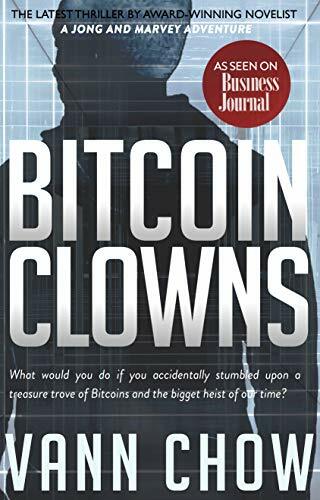 Set in Shanghai, China, the home of the world’s largest cryptocurrency trading platform and the 6th largest cryptocurrency in the world, the novel Bitcoin Clowns tells the story of a young, talented programmer Jong He who plunged into the mysterious and dark world of cryptocurrency and blockchain technologies because of a pet cryptocurrency he created as a joke to mock the ICO speculative madness happening around the world. Little did he know his invention would be quickly adopted and became the latest fad of the town, got backed by international banks, helped create the world’s first cryptocurrency Billionaire, and even attracted adoption from a slew of criminals including South American counterfeit drug cartel and anonymous Eurasian hackers slash Robbin-hoods. In the meantime, his cousin Cao had disappeared because of financial troubles at his company that sold ill-designed cryptocurrency funds of debatable legitimacy and his partner was found dead in the office after a client lost a huge amount of investments passing through their hands. His cousin’s other sketchy business partners were reluctant to tell him anything and law-enforcement was grossly unfamiliar with these new kinds of financial instruments to see through the thick plot of deception in front of them. Jong had to rely on his exceptional luck, incredible courage and loyalties of his friends once again to find his cousin and retrieve the missing millions. The action-packed fiction told in first person perspective follows Jong He, a highly intelligent but socially awkward Chinese programmer and his friends around the financial capital of the country in the cat-and-mouse chase of the biggest cryptocurrency heist of our time.